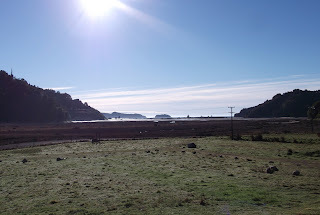 Tim has recently moved to his new studio overlooking the Otuwhero estuary at Sandy Bay near Marahau. The building, an ex tobacco kiln and shed was recently refurbished to house the carved seagoing waka (canoe) that Tim had carved. The shed seems purpose built for Tim's practice, with a large airy gallery/studio and extensive workshop space. The location is stunning, with expansive views over the estuary and coastline, and enfolded by bush clad hills. Tim will be opening this new studio in spring on a by appointment basis. Watch this space. Shapeshifter this year was a great show to be in. Generally, the standard of all the works was high. 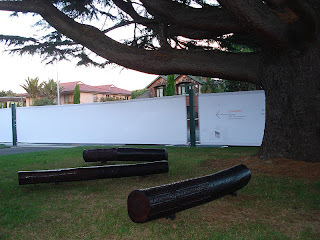 My works, three 'Logs' of carved and dyed Robinia wood were well received by my peers and the public. 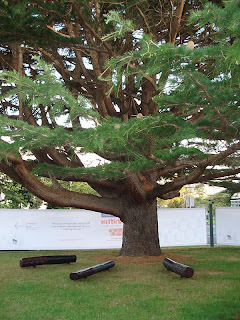 The site looked made specially for the works, with the branches of the spreading tree corresponding with each of the works underneath. Two of the works were purchased at the exhibition, with one going to Hawkes Bay,and the other to Wellington. Thanks to the New Dowse and Hutt Rotary Club for their great organisation. The commission from the sale of works goes toward worthy charities, and I'm glad my works can help support these. Tim Wraight is a New Zealand artist specialising in wood sculpture.